Movement at the horse paddock | There once was a creek . . . Recently, while driving along Rainworth Road past the south-east corner of the governor’s property, I noticed something new. Running through this grassy area, which I understand to be the governor’s old horse paddock, were two rows of newly planted trees. Interspersed among the new trees, which still were housed in their protective plastic tents, were what looked to be some native grasses or lomandras. The pond at the edge of the governor’s paddock. The two rows of newly planted trees can be seen in the background. One of the two plantings follows a course that might be similar to that of the original stream of Western Creek, which once flowed through this land. 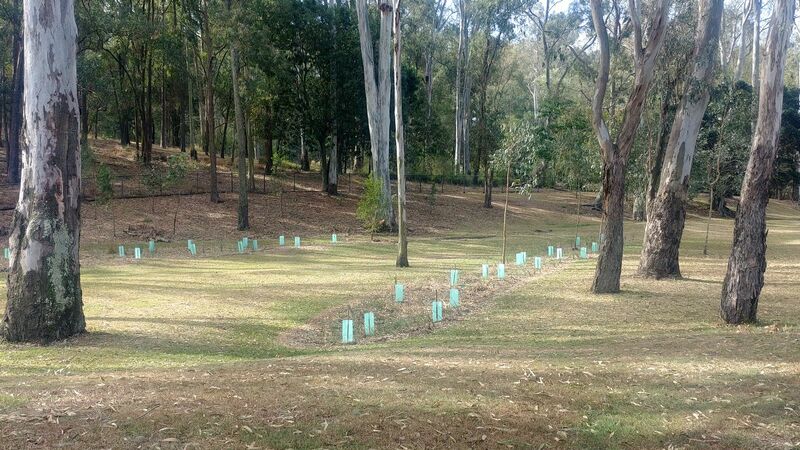 The two new plantings in the governor’s paddock at the south-east corner of the Fernberg property. I’ve suggested previously that this piece of land is something of a missed opportunity. It is visually uninspiring, ecologically bland, and inaccessible to the public. Its one redeeming feature is the rehabilitated pond along the fence, the beauty of which only serves to illustrate what could be done with the rest of the site if the will was there. These new plantings, while far from a full-scale restoration of the site, are a positive sign. I look forward to seeing how they develop, and to learning if they might be part of a larger rehabilitation effort. This entry was posted in Short articles and tagged fernberg, fernberg pond, rehabilitation by angusv. Bookmark the permalink. Hi Angus — yet another interesting post about the Western Creek and its environs! 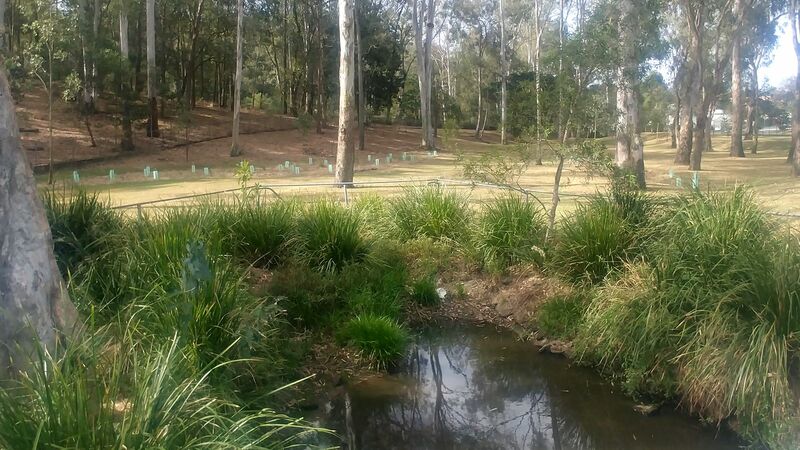 I also noticed your 2012 post on the same page about the remnant pond at Norman Buchan Park — I believe the pipeline shown in the photo is the 1866 pipe from the Enoggera Reservoir (20-inch diameter wrought iron).